Frontier Developments have smashed a champagne bottle on the side of Elite Dangerous: Beyond – Chapter One, launching the long-named first part of this year’s free expansions for their freefrom space sandbox. Along with the newly available expansion, the studio released a trailer that shows off just what you can get up to in Chapter One. 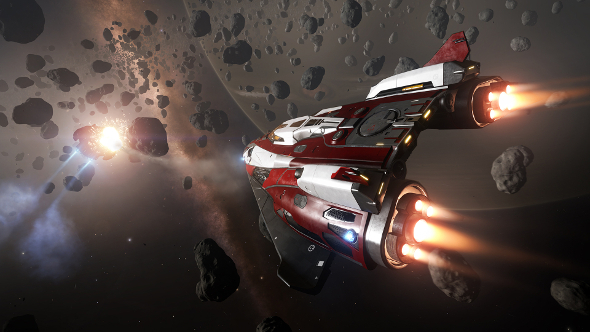 Here’s everything that’s added in Elite Dangerous: Beyond – Chapter One. Chapter One addresses a real spread of Elite’s systems but the standout feature are the new Wing missions. The new missions are built to be tackled by multiple players, so the challenge (and the rewards) will be greater. Chapter One also brings a slew of changes to crime and punishment mechanics, improves the look of the game’s already pretty planets, and newly improved trading system so you’re better able to navigate the Elite Dangerous economy and make the best trades. For players who have been following the spread of the Thargoid menace, Chapter One moves the war on a stage with new weapons to fight the aliens. The expansion adds a warship for players to commandeer: The Chieftain. Elite Dangerous: Beyond – Chapter One is a free update so as soon as Frontier press the button you should be able to start upgrading your game.